Though he learnt art of pleadings and conveyincing from his father during the course of his studies but after completion of his pupilage he joined M/s Muneer A Malik & Co, M/s Haleem Khan & Co, M/s Manzar Alam & Co, M/s Academy of Jurists, etc and polished his skills. 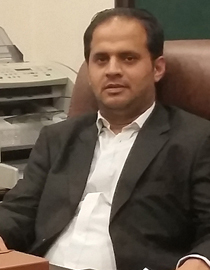 Having about 10 years experience as an active litigator in lower courts as well as at High Court of Sindh at Karachi and Islamabad High Court, he has a considerable experience in Civil Law, Family Law, Customs, Property Law, Constitutional Law, Rent Laws, Electricity Laws, Services / Employmental Laws, Criminal Law etc. He also assisted Mr.Abrar Hasan, Advocate Supreme Court, Mr. Masroor Ahmad Alvi, Advocate Supreme Court, and Mr. Muhammad Iqbal Adocate Supreme Court in several cases before Hon’able Supreme Court of Pakistan at Karachi. His practice revolves around the areas of Civil Law, Criminal Law, Property Law, Law of Tort, Banking Law, etc where he has not only attained fabourable results but also earned a good repute in these fields. He has several reported judgments to his credit.